Hunthausen is remembered for his fearless witness for peace. His prophetic stance in opposition to the proliferation of nuclear weapons and in particular the Trident submarine and its first-strike capability brought him criticism, and even condemnation, from near and far, in a time of significant expansion of the nuclear arms race. Rock-solid in his understanding of the non-violent way of Jesus, he withheld payment of half of his federal taxes in protest of the arms race and permanent war economy that had emerged by the mid-1980s. The Archbishop, Bill Cate and the Rev. Loren Arnett of the Washington Association of Churches could be seen leading the largest march in the United States, 30,000 strong from St. James Cathedral to Saint Mark’s Cathedral, against the First Gulf War in 1991. Michael Ramos, Executive Director of the Church Council of Greater Seattle, shared a personal reflection: Archbishop Hunthausen was my bishop. His commitment to peacemaking and support of sanctuary for Central American refugees was part of my original attraction to come to the Northwest. He led by example, without self-promotion or manifestations of power and prestige. He was utterly sure of himself as a prayerful creature of God who once he felt the Spirit’s promptings, allowed himself to be guided by these without fear, with unshakeable conviction. My brief encounters with him were with someone who treated me with complete dignity and respect, co-equals in the cause of peace. 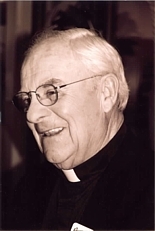 One time, I invited him to celebrate mass in the Jesuit Volunteer house named after him, Raymond House, with a group of young adult volunteers. All present felt not so much in the presence of an archbishop but rather in the presence of a holy human being, a person of God, who cared about them. As the first lay, Latino, Catholic Executive Director of the Church Council of Greater Seattle, I can surely say that I attribute the inspiration for my growth as a person and ecumenical minister to the authoritative, grounded, and prophetic witness of the beloved Archbishop Hunthausen. Such leaders have much to say to us at such a time as this. 2 p.m to 5 p.m. – Viewing, St. James Cathedral, Seattle. 7:30 p.m. – Vigil Service, St. James Cathedral. Archbishop J. Peter Sartain of Seattle, presider; Bishop Emeritus William Skylstad of Spokane, homilist. 11 a.m. – Funeral Mass, St. James Cathedral. Archbishop Sartain, presider; Father Michael G. Ryan, pastor of St. James Cathedral, homilist.